Some Phat Fibery love landed in my mailbox yesterday. 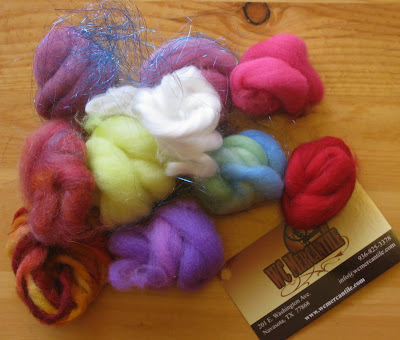 I've been keeping myself from spinning some of these lovelies until I could get some pictures of the wonderfulness. This is probably my favorite box I've received so far. I highly recommend following the linkies to these indie artists shops and grabbing some stash enhancement for yourself. 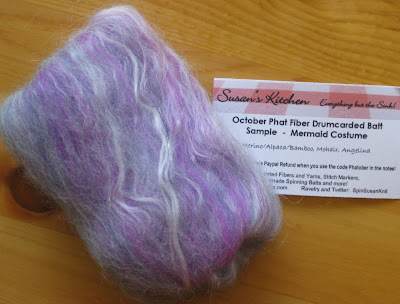 I know there are a few of these samples that I'm hoping to find full sized versions in the Phatties shops. 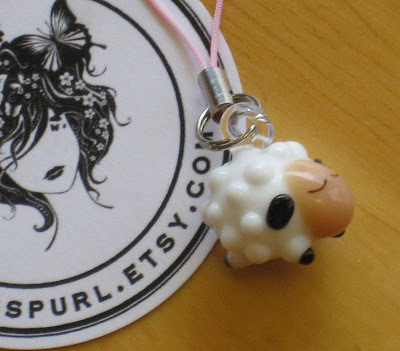 My two faves are the Sheepy cell phone charm from MissPurl and the Harlequin Girl batt. I ran to my cell phone to attach the charm, only to discover that my stupid phone doesn't have an attachment spot for the charm! 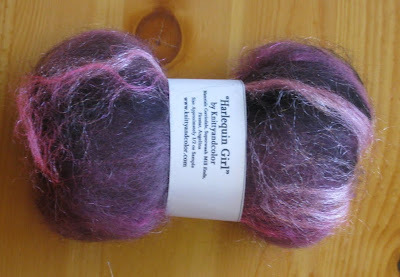 And only through extreme self discipline did the Harlequin Girl batt make it for its photo op. 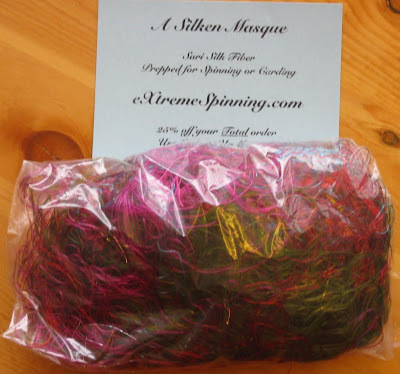 Exteme Spinning has provided sari silk fiber. 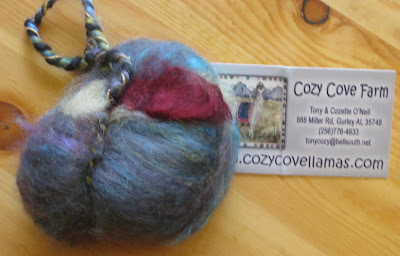 I've seen sari silk carded into black merino to beautiful effect - I might have to find some black to blend this with! WC Mercantile has provided a mystery grab bag of samples. 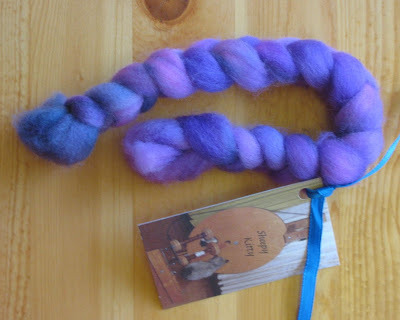 I've been considering trying needle felting, this just might push me over the edge. 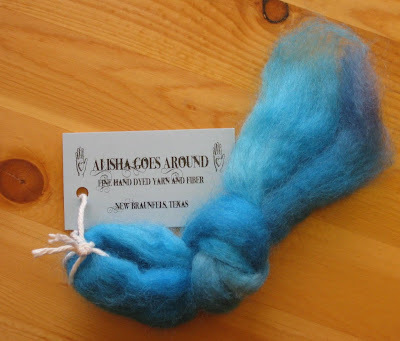 Roo's Moonbeams from Moonwood Farm are the softest things ever. I think I might keep this one as a pet! 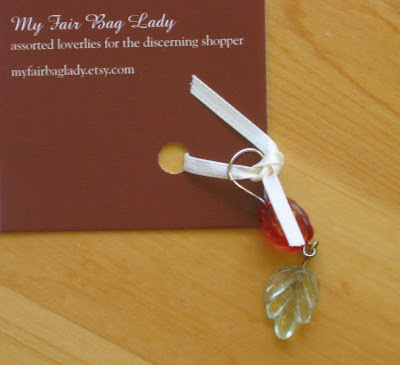 My Fair BagLady has contributed this pretty leaf stitch marker. 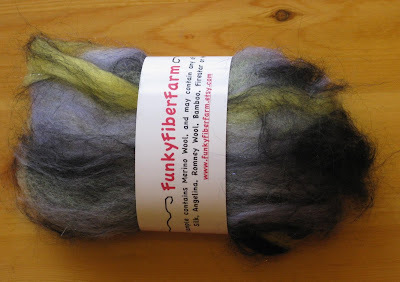 Funky Fiber Farm has provided a lovely mixed batt in bewitching colors. 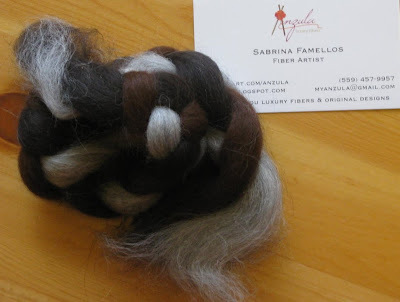 Hampton Artistic Yarn's sample is a beautiful batt of black and white with silver sparkle. 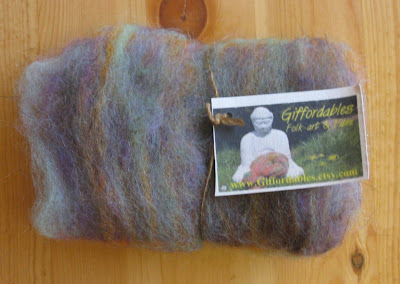 Giffordables "All Hallow's Eve" batt is a beautiful earthy batt that reminds me of some of the beautiful yarns Sue has posted on her blog. 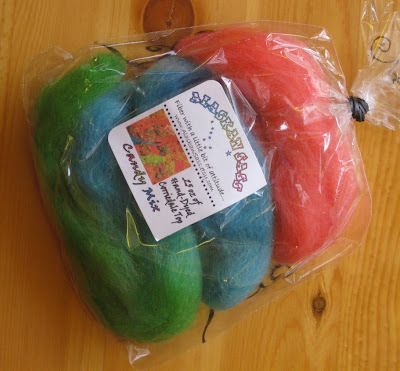 Another of M's faves: Alaskan Sass (say that 10 times fast) Candy Mix. B has claimed this button from Button Adoration for another Button necklace. 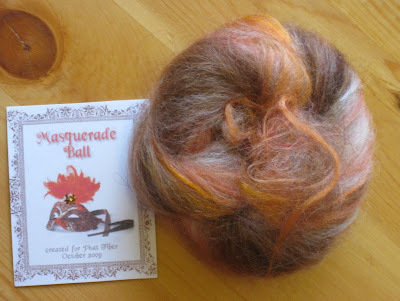 Lot's of fun spinning to come! 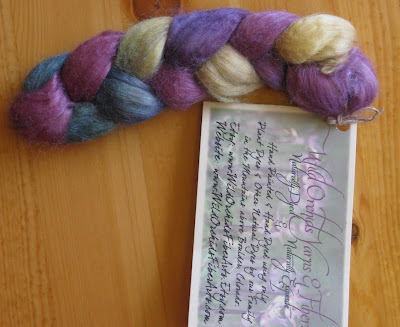 looks great- I love that little sheep stitch holder.